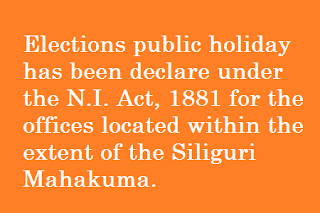 Elections public holiday has been declare under the N.I. Act, 1881 for the offices located within the extent of the Siliguri Mahakuma. In view of the elections to the Siliguri Mahakuma Parishad under Siliguri Sub-Division area and bye-elections to the 341 (three hundred and forty one) vacant seats of Gram Panchayats, 72 (seventy two) vacant seats of Panchayat samitis and two vacant seats of Zilla Parishads all over the state (as per list enclosed with the memo no. 2626-SE C/5B-7/2015 (Pt.II) dated 17-08-2015 of the State Election Commission) declared under notification No. 649/SS/PN/O/l/lE-03/2015 and No.650/SS/PN/O/1E-03/2015 dated 03-09-2015 respectively to be held on 3rd day of October, 2015 (Saturday), the Governor is hereby pleased to declare the said day as public holiday under the Negotiable Instruments Act, 1881 for the offices located within the extent of the Siliguri Mahakuma Parishad, under Siliguri Subdivision and respective areas of Gram Panchayats, Panchayat Samitis and Zilla Parishad seats. All Government Offices, Organisations under it, Undertakings, Corporations, Boards, Statutory and Local Bodies, Educational Institutions, etc. situated within the above areas shall remain closed on the date of poll so that every employee is able to exercise his/her right of franchise in the election. 2. The Labour Department will issue suitable instructions to shops, Commercial and Industrial Establishments including Tea Gardens to declare the said date for the concerned areas as paid holiday for the workers to exercise their franchise in the election. 3. In case the date of poll is a working day in any central Government or any other establishments within the concerned areas, the employees who are voters to the election shall be permitted to cast their votes by way of special leave. 4. In case of employee working outside the concerned areas and when the date of poll has not been declared as holiday there as in Para I above, he/she shall be allowed special leave for the day. 5. In case of re-poll, the employees/workers shall be allowed to cast their votes on the date of repoll in the manner as in Para 3 and 4 above. 6. 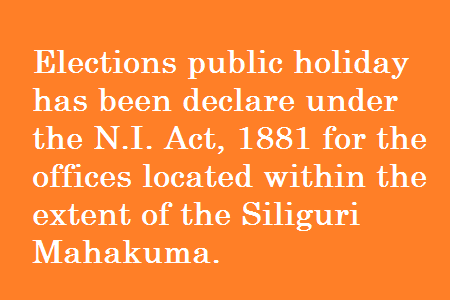 The day before the date of poll being the date of dispatch has already been declared as a public holiday under N.I Act. The Armed Forces, Railways, Defence, and Department of Post are among the largest employers under the control of the Central Government. The largest among them, the Railways, employs more than 13 lakh employees. 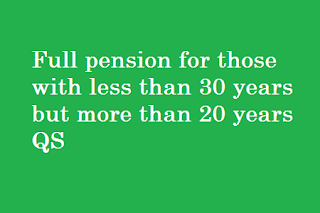 In all, the Central Government employees more than 34 lakh, and has more than 38 lakh pensioners on its list. The Centre has now ordered the implementation of an old and forgotten law. 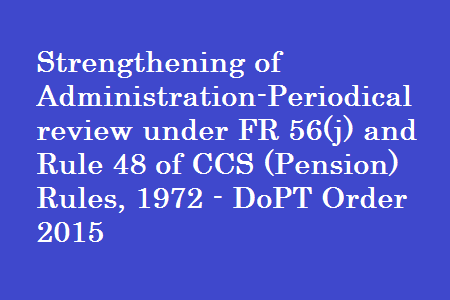 According to Section 56 (J) and 56 (I) or Rule 48(1) (b) of CCS (Pension) Rules 1972, the performances of those between the ages of 50 and 55, and those who have completed 30 years of service must be reviewed by senior officers once every three months, vis. Jan to Mar, Apr to Jun, Jul to Sep and Oct to Dec. All the departments have been ordered to review the performances and implement this rule immediately. 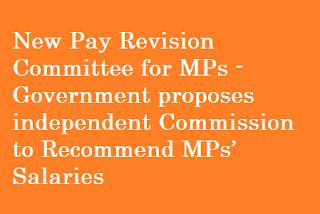 And also advised to constitute a Review Committee consisting of two Members at appropriate level. Relevant orders to this effect were issued on September 11. Senior officials and employees of various departments are confused and terrified following the orders. Some claim that the government has taken this step to stifle the indefinite strike to be held in November. The Central Government employees union and the railway employees’ union claim that, armed with this rule, the government can send home workers under the compulsory retirement scheme. Worse hit due to the new rule are the senior and experienced members of the staff. These employees are already affected by denial of increments and de-promotions. The federations claim that the Centre is treating these experienced employees as unreliable and talentless manpower and is hell-bent on terminating their services. The government is conspiring to use this law and give compulsory retirement to employees over the age of 50/55 by branding them as unfit for work. The law also makes it possible for the government to find faults with their work. The move is intended to intimidate the employees into not participating in the indefinite strike in November. 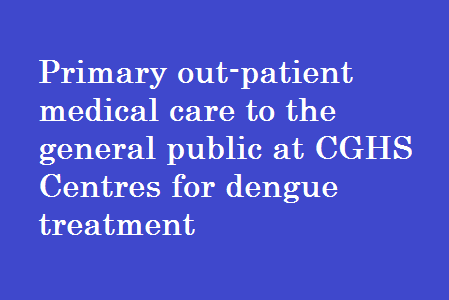 As part of the various initiatives taken by the Ministry of Health & Family Welfare to deal with the situation arising out of spread of Dengue, all doctors at various CGHS Wellness Centres in Delhi and NCR shall provide consultation services and primary out-patient medical care to all citizens- whether CGHS beneficiaries or not- who may visit the Wellness Centres with symptoms of Dengue, primarily high fever. 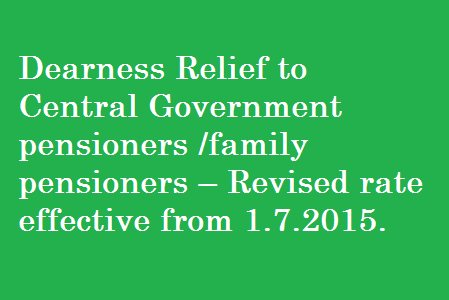 Grant of Dearness Relief to Central Government pensioners/family pensioners – Revised rate effective from 1.7.2015. 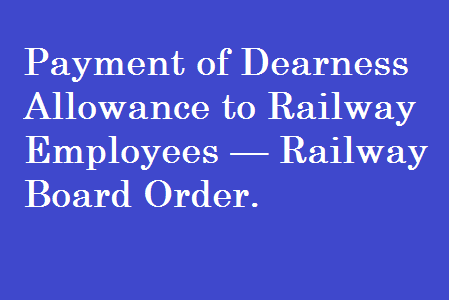 Payment of Dearness Allowance to Railway employees — Revised rates effective from 01.07.2015. 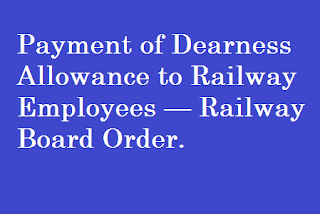 Sub: Payment of Dearness Allowance to Railway employees — Revised rates effective from 01.07.2015. Please refer to this Ministry’s letter of even number dated 13.04.2015 (S.No. PC-VI/349, RBE No. 35/2015) on the subject mentioned above. The President is pleased to decide that the Dearness Allowance payable to Railway employees shall be enhanced from the existing rate of 113% to 119 % with effect from 1 st July, 2015. 2. The provisions contained in Paras 3, 4 & 5 of this Ministry’s letter of even number dated 09.09.2008 (S.No. PC-VI/3, RBE No. 106/2008) shall continue to be applicable while regulating Dearness Allowance under these orders. 3. The additional installment of Dearness Allowance payable under these orders shall be paid in cash to all railway employees. The payment of arrears of Dearness Allowance shall not be made before, the date of disbursement of salary of March, 2014. The arrears may be charged to the salary bill and no honorarium is payable for preparing separate bill for this purpose. 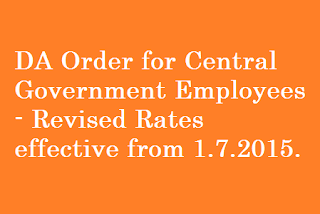 DA Order for Central Government Employees - Revised Rates effective from 1.7.2015. Subject: Payment of Dearness Allowance to Central Government employees – Revised Rates effective from 1.7.2015. The undersigned is directed to refer to this Ministry’s Office Memorandum No. 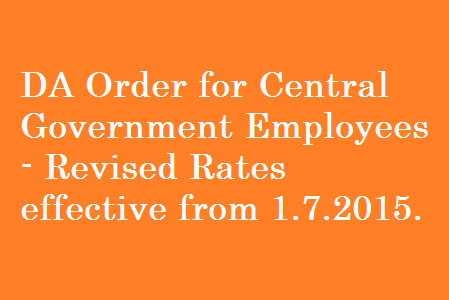 1/2/2015-E-II (B) dated 10th April, 2015 on the subject mentioned above and to say that the President is pleased to decide that the Dearness Allowance payable to Central Government employees shall be enhanced from the existing rate of 113% to 119% with effect from 1st July, 2015. 3. The additional installment of Dearness. 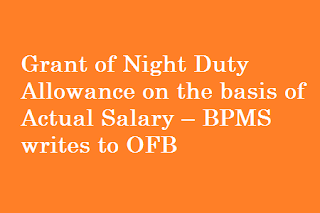 Allowance payable under these orders shall be paid in cash to all Central Government employees. 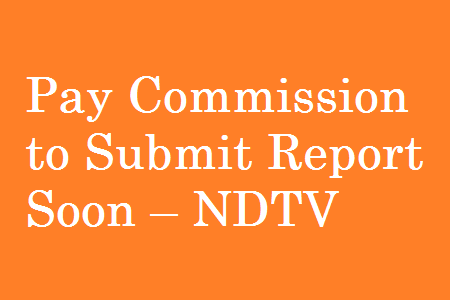 Sixth Pay Commission was implemented with effect from January 1, 2006, the fifth from January 1, 1996 and the fourth from January 1, 1986. 1. 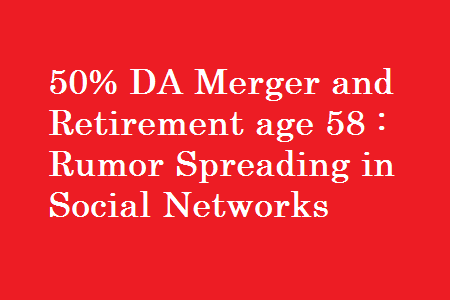 Central Government decided to merge 50% DA with basic pay with effect from 1.1.2015. 2. It went on to say that age of Retirement will be on completion of 33 Years of service or at the age of 58 Years whichever is earlier. The 7th CPC is expected to submit its report shortly and due to Bihar elections the Central Government cannot take any policy decisions in this regard. Hence it is clarified that none of the above news are correct. Sub: Payment of difference on arrears of TA/DA arising out of Railway Board’s letter No.F(E)I/2011/AL-28/18 dt.29.4.14. 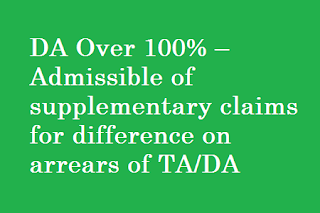 One of the Railways has sought clarification regarding a supplementary claim for difference of TA/DA arising out of enhancement of Dearness allowance upto 100% w.e.f. 1.1.14 after issue of Board’s letter No.F(E)/2011/AL/28/18 dt. 29.04.14. 2. 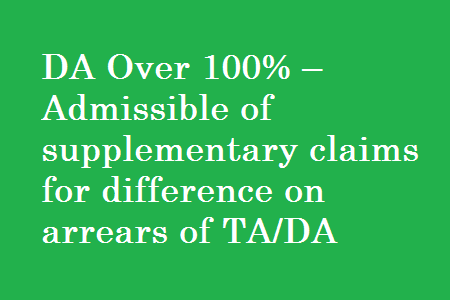 The matter has been examined in Board’s office and it is clarified that where TA/DA has been paid at old rates supplementary claims for difference of TA/DA would be admissible in respect of official tours made on or after 01.01.14 consequent to increase in the rates of TA/DA by 25%, w.e.f. 01.01.2014. 3. This disposes of South Eastern Railway’s letter No.ENG/Bills/TA&DA/604 dated 25.08.2015. DAK BHAWAN, SANSAD MARG, NEW DELHI-11001. 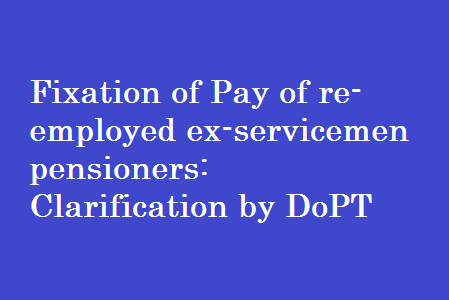 Sub: Clarification regarding fixation of Pay of re-employed ex-servicemen pensioners retiring before attaining age of 55 years and who hold post below commissioned officer rank in the Defense Forces. I am directed to forward herewith a copy of clarification issued by the Ministry of Personnel, PG and Pensions, Department of Personnel and Training, New Delhi, DoPT ID Note No.1101965/2015-Estt. (Pay-II) dated 28th August 2015 on the subject and above, for kind information and further necessary action at your end. 2. 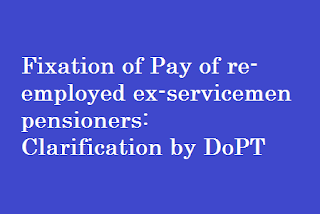 Clarification may be circulated to all sub-ordinate offices concerned, with direction to dispose all cases of pay fixation of re-employed ex-servicemen pensioners retiring before attaining age of 55 years and who hold post below commissioned officer rank in the Defense Forces, in light of clarification issued. PPS to Members of Postal Services Board. 2. The matter has been examined in this Department. 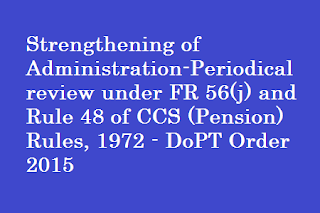 It is pointed out that paras 4(a), 4(b)(i) and 4(d)(i) of CCS (Fixation of Pay of Re-employed Pensioners) Orders, 1986 as amended vide this Department’s O.M. No.3/19/2009-Estt. (Pay.II) dated 5.4.2010, provide that in case of ex-servicemen who held post below Commissioned Officer rank in the Defence Forces and in the case of civilians who held posts below Group ‘A’ posts at the time of their retirement before 55 years of age, the entire pension and pension equivalent of retirement benefits shall be ignored, that is, no deduction on this count is to be made from the initial pay fixed on re-employment. Also, in terms of the Para 4(b)(i) of CCS (Fixation of Pay of Re-employed Pensioners) Orders, 1986, as amended vide this Department’s O.M. No./19/2009-Estt. 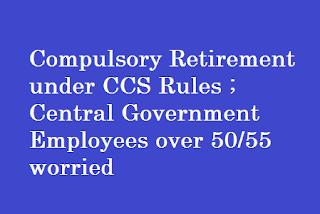 (Pay.II) dated 5.4.2010, the initial pay on re-employment shall be fixed as per the entry pay in the revised pay structure of the re-employed post applicable in the case of direct recruits appointed on or after 1.1.2006 as notified vide Section II, Part A of First Schedule to CCS(Revised Pay) Rules, 2008. These instructions do not provide for protection of last pay drawn before retirement, in such cases. With due regards, it is submitted for your kind information that the Central Executive Committee meeting of this federation has held on 08th & 09”” Sep. 2015 at Dr APJ Abdul Kalam Complex, DRDO Township, Kanchanbagh, Hyderabad and 03 Resolutions have been unanimously adopted by the CEO of the federation & the same are enclosed herewith for your kind consideration and further necessary action please. 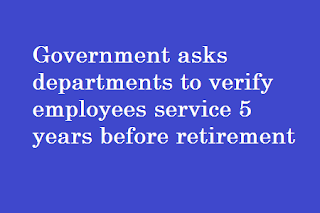 It has been observed that processing of pension cases of the employees retiring from government service quite often gets delayed on account of issues relating to verification of service from time to time by authorities, the Personnel Ministry said in a directive. In view of the fact that review Petition filed by UOI RP (C) NO. 2565/2015 in SLP (C) No. 6567/2015 UOI Vs M.O. Inasu dismissed by HSC on 28.8.2015, and Following file notings of DOPW (obtained under RTI)let us hope DOP&PW will now issue necessary instructions extending benefit of full min. 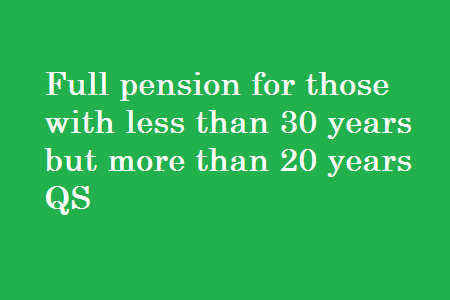 pension to all pre 2006 pensioners irrespective of Q.S. rendered. The extract from the File Noting obtained from DOP&PW under RTI ACT, on pro rata pension matter. 12. It may be mentioned that in its order dated 22.1.2013 and 16.8.2013 in OA No. 715/2012 and OA No. 1015/2012 respectively, Hon’ CAT Ernakulam Bench directed that the revised pension fixed in terms of para 4.2 of OM dt. 1.9.2008 would not be reduced pro rata in cases where the qualifying service of a pre 2006 pensioner was less than 33 yrs. This order of Hon CAT was challenged by D/o Revenue in the H.C. of Kerala in OP(CAT) No. 4/2012 and No. 8/2012. Hon’ H.C. of Kerala dismissed the Op(CAT) No. 4/2012 and No. 8/2012 vide order dt. 7.1.2014. The SLP filed by the Dept. of Revenue against the order dt. 7.1.2014 has also been dismissed by Hon’ S/C. in its order dated 20.2.2015. Learned ASG, Sri P.S.Narsimha has advised to file a Review Petition. The concerned file is presently with MOL(CA Section) and Ms. Rekha Pandey, Adv. is drafting the RP. Grant of 30% HRA to staff working Umdanagar, Medchal and Gundlapochampally on par with the staff working in GHMC limits. 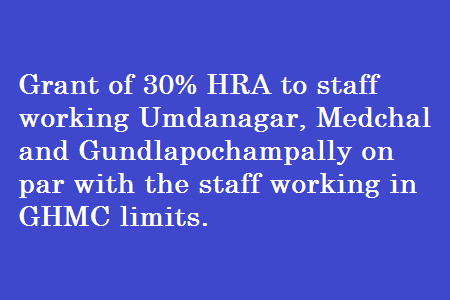 Sub: – Grant of 30% HRA to staff working Umdanagar, Medchal and Gundlapochampally on par with the staff working in GHMC limits. Please refer to your office letter No. SCR / P-HQ / Ruling / O / 811 / HRA dated 29.06.15 on the above noted subject. As per the dependency certificates dated 23.6.2015 issued by the District Collector of Ranga Reddy District, Umdanagar, Medchal & Gundlapochampally in Andhra Pradesh fulfill all the conditions prescribed in Para 2 of Board’s letter No.PC-65 / HRA-1/3 dated 22-7-1965, as amended from time to time. The President is, therefore, pleased to decide that Railway employees posted at Umdanagar, Medchal and gundlapochampally, in Andhra Pradesh may be paid House Rent Allowance at the rates applicable to those posted with the classified city of Hyderabad (UA) [‘X’ class city] subject to fulfillment of the conditions laid down for grant of House Rent Allowance. 2. These orders will be valid from 01.06.2015 (a) for a period of 3 yrs ie upto 31.05.2018 or, (b) till the conditions prescribed in Para 2 of Board’s letter 22-7-1965, referred to above continue to be fulfilled in respect of Umdangar (ii) Medchal & (iii) Gundlapochampally or (c) until issue of any further orders in this regard by the Ministry of Railways, whichever is earliest. 3. The period at (a) of Para 2 above may, however, be extended after obtaining a fresh Dependency Certificate as prescribed in clause (ii) of Para 2 of Board’s letter dated 22-07-1965, as amended from time to time and in accordance with the provisions of Board’s letter No. E (P & A) II-85 / HRA-12 dated 11-3-1986. 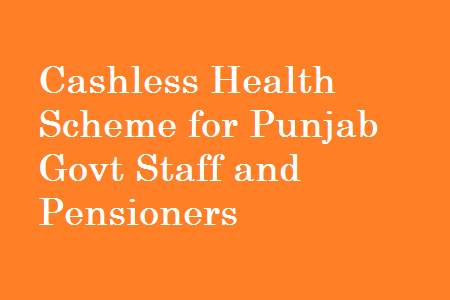 In a significant decision benefiting over 6.5 lakh employees and pensioners of the state government, the Cabinet today gave its nod for implementing a cashless health insurance scheme in lieu of the existing policy of reimbursement of medical expenses. A decision to this effect was taken during the Cabinet meeting chaired by Chief Minister Parkash Singh Badal held at Punjab Bhawan this evening. 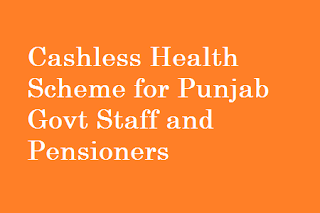 In a Rs 107 crore gift to the employees, the facility of cashless treatment would be provided to government employee/pensioners and their dependents in more than 250 empanelled public and private hospitals in Punjab, Chandigarh and NCR (Delhi, Gurgaon and Noida). To safeguard the interests of general public against frauds by financial establishments, the Cabinet okayed the Punjab Protection of Interests of Depositors (in Financial Establishments) Bills, 2015. The Cabinet also approved the creation of 417 posts of beldar in the Forest and Wildlife Department to regularise those beldars who have completed 10 years in service and were left out in 2011. To enable the Excise and Taxation Department to maximise the collection of taxes and duties and provide prompt and hassle free services to the tax payers, the Cabinet gave green signal for restructuring of the Excise and Taxation Technical Services Agency. 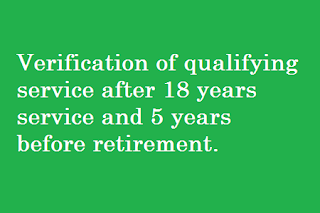 Verification of qualifying service after 18 years service and 5 years before retirement. 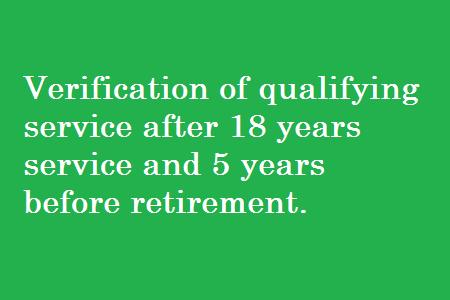 Sub: Verification of qualifying service after 18 years service and 5 years before retirement. 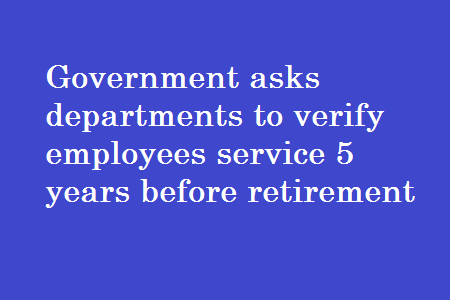 It has been observed by this Department that processing of pension cases of the employees retiring from the government service quite often get delayed on account of the issues relating to verification of service from time to time by the concerned authorities during the service of the concerned employee. Although detailed instructions regarding verification of service have been issued by Department of Personnel & Training and by this Department, these instructions are not meticulously adhered to resulting in delay in sanctioning of retirement benefit of the employees. 2. 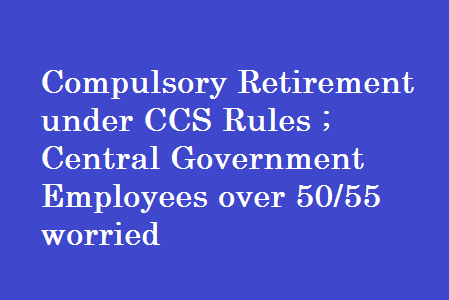 Rule 32 of the CCS (Pension) rules, which existed prior to December, 2012 provided for issuing of a certificate in Form 24 by the Head of Office in consultation with by the Account Officer regarding completion of qualifying service of 25 years. These rules have been amended subsequently and as per the existing provisions, a certificate regarding qualifying service is required to be issued by the HOO after completion of 18 years of service and again 5 years before the date of retirement of an employee. Rule further provide that verification done under that rule shall be treated as final and shall not be reopened except when necessitated by a subsequent – change in the rules and orders governing the conditions under which the service qualifies for pension. 3. It has been noticed that the certificates regarding qualifying service are not invariably issued to the government servant as required under the rules. All Ministries/Departments etc. are therefore requested to bring these provisions to the notice of Heads of Offices and PAOs for strict compliance. Non-compliance of this statutory requirements may be viewed seriously. 4. In order to review status regarding compliance of these rules, all Ministries/Departments are requested that the information may be collected from all establishments / office under them and the same may be compiled and sent to this Department by 15th October, 2015 in the enclosed proforma. 3. In every review, the entire service records should be considered. The expression ‘service record’ will take in all relevant records and hence the review should not be confined to the consideration of the ACR / APAR dossier. The personal file of the officer may contain valuable material. Similarly, the work and performance of the officer could also be assessed by looking into files dealt with by him or in any papers or reports prepared and submitted by him. It would be useful if the Ministry/Department puts together all the data available about the officers and prepares a comprehensive brief for consideration by the Review Committee. Even uncommunicated remarks in the ACRs/APARs may be taken into consideration. The officer would live by reputation built around him. In an appropriate case, there may not be sufficient evidence to take punitive disciplinary action of removal from service. But his conduct and reputation is such that his continuance in service would be a menace to public service and injurious to public interest. Thus while considering integrity of an employee, actions or decisions taken by the employee which do not appear to be above board, complaints received against him, or suspicious property transactions, for which there may not be sufficient evidence to initiate departmental proceedings, may be taken into account. Judgement of the Apex Court in the case of Shri K. Kandaswamy, L.P.S. (TN:1966) in K. Kandaswamy vs Union Of India & Anr, 1996 AIR 277, 1995 SCC (6) 162 is relevant here. There were persistent reports of Shri Kandaswamy acquiring large assets and of his getting money from his subordinates. He also indulged in property transactions which gave rise to suspicion about his bonafides. 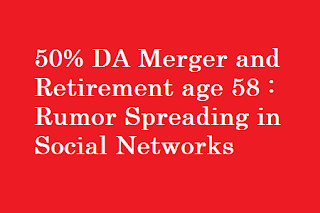 The Hon’ble Supreme Court upheld his compulsory retirement under provisions of the relevant Rules. (i) Where there are Boards viz CBDT, CBEC, Railway Board, Postal Board, Telecom Commission, etc. the Review Committee may be headed by the Chairman of such Board. 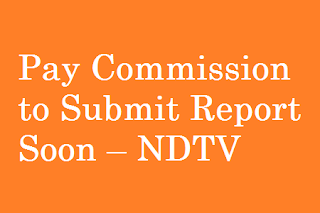 (ii) Where no such Boards/Commissions exist, the Review Committee may be headed by Secretary of the. Ministry/Department. 9. hi addition to the above, the Secretary of the Ministry/Department is also empowered to constitute internal committees to assist the Review Committees in reviewing the cases. These Committees will ensure that the service record of the employees being reviewed, along with a summary bringing out all relevant information, is submitted to the Cadre Authorities at least three months before the due date of review. Ref: (i) NFIR’s PNM item no. l8l20ll. Since LDCE quota for promotion to pre-revised Scale of Rs. 6500-10,500 was very very limited, only a couple of persons were accommodated and the remaining persons were promoted through normal promotion against promotion quota. 2. Although in the meeting held on 19/05/2015 with the Railway Board (MS & FC) the discussions were inconclusive, the Federation did mention that those Drawing cadre staff recruited with the entry qualification of B. Tech were allotted incorrectly the pay Scale of 5500- 9000 (6th CPC/GP 4200/-), instead granting them the 5th CPC pay Scale of 6500-10500(6th CPC GP 4600/-). 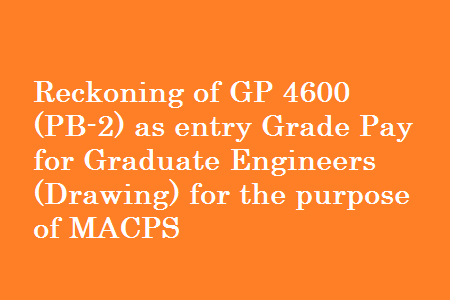 To remedy this Anomalous situation, it was suggested that in the case those Engineering Graduates (Drawing), they be reckoned as holders of entry Gp 4600/- -PB-2for the limited purpose of MACP duly appropriately modifing the Board’s ietter dated 20th June 2011 for covering all such cases. As another meeting date has not yet been fixed, the issue continues to remain unresolved. It is also relevant to place on record that while some Engineering Graduates benefited on account of induction against LDCE quota, the similarly placed Engineering Graduates who got appointed against promotion quota vacancies of Rs. 6500-10,500 (5th CPC) have not been covered-for the against LDCE Quota. This anomalous situation needs to be rectified for ensuring equal reatment to all the Engineering Graduates of Drawing cadre whether reached pay scale of Rr. 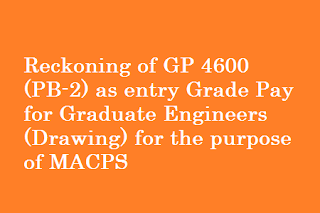 6500-10500 through promotion or through LDCE quota. 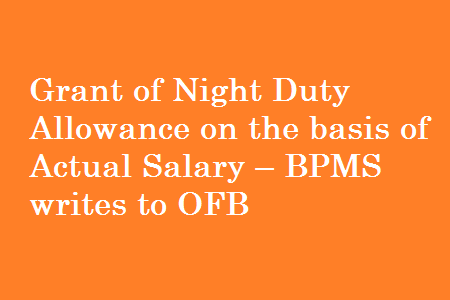 NFIR, therefore, requests the Railway Board to reconsider their decision and see that all Engineering Graduates of Drawing cadre are granted MACP duly treating them as holders of entry Grade Pay of Rs.4600/-(PB-2). (Including Production Units & RDSO). 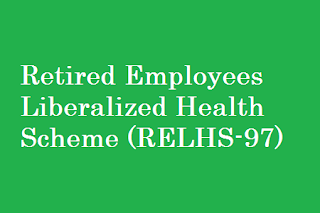 Sub:- Retired Employees Liberalized Health Scheme (RELHS-97). Ref:- (i) Board’s letters No.2003/H/28/1/RELHS dated 28.01.2005, 21.10.2005, 30.12.2005, 10.05.2006, 10.01.2007 & 16.03.2009. (ii) Board’s letter No. 2011/H/28/1/RELHS/Court case dated 31.05.2012. The question of extending RELHS 97 facility to those retired railway employees also who joined Railways late but retired at the normal age of superannuation before completing 20 years of service i.e. the minimum qualifying service required for joining RELHS, has been engaging attention of Ministry of Railways for some time. 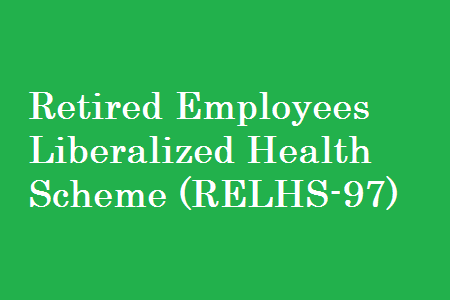 The issue was also been raised by both the recognized employee Federations (AIRF & NFIR). After careful consideration in the matter, the Competent Authority in the Ministry of Railways has decided to extend RELHS 97 to all those railway employees who retired at the age of superannuation irrespective of number of service before superannuation. 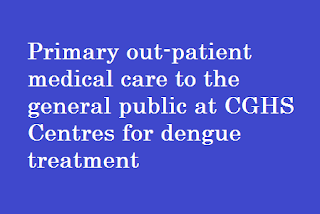 If such employees have any previous service from an other Government Department which makes them eligible for medical facility of that Department also, they should opt or one of the two facilities viz. medical facility of the Department o previous service or . RELHS-97. Other terms and condition of joining RELHS-97, mentioned in Board’s letters cited under reference, will remain unaltered. Wide publicity should be given to the above position. 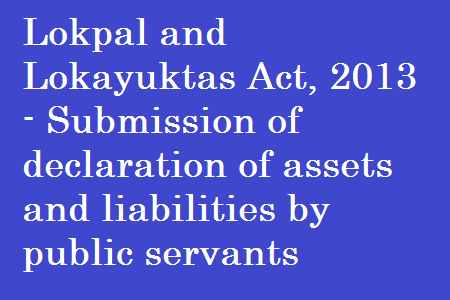 Lokpal and Lokayuktas Act, 2013 - Submission of declaration of assets and liabilities by public servants belonging to CSSS & CSCS - regarding. 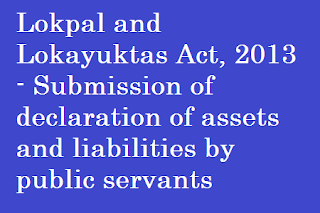 Subject:- Lokpal and Lokayuktas Act, 2013 - Submission of declaration of assets and liabilities by public servants belonging to CSSS & CSCS - regarding. The undersigned is directed to refer to this Department’s OM of even number dated 15.04.2015 regarding declaration of assets and liabilities by CSSS & CSCS officials under the Lokpal and Lokayuktas Act, 2013 and to say that, vide Notification No. 407/12/2014-AVD-IV(B) dated 27.04.2015 and also OM No.407/12/2014-AVD-IV(B) dated 25.04.2015 of this Department,the last date for filling of returns by public servants, as on 01.08.2014 and as on 31.03.2015, has been extended to 15th October, 2015.